I am now in the thick of furnishing the houses we have renovated and built at the Old Duck Inn site right here in Eleuthera. 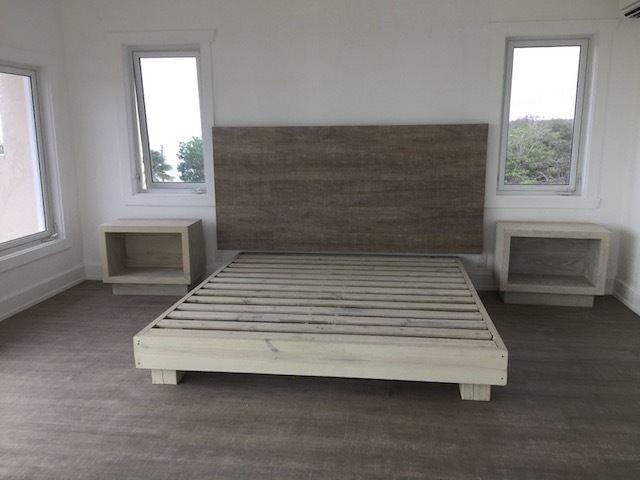 Usually I buy pretty much everything from the US and ship it over but this time I decided to have all the bed frames and nightstands made here on the island by one of our ace cabinet makers ! Rikki is originally from Jamaica but has lived and worked in the Bahamas for the last eighteen years and has been working for us on this project. 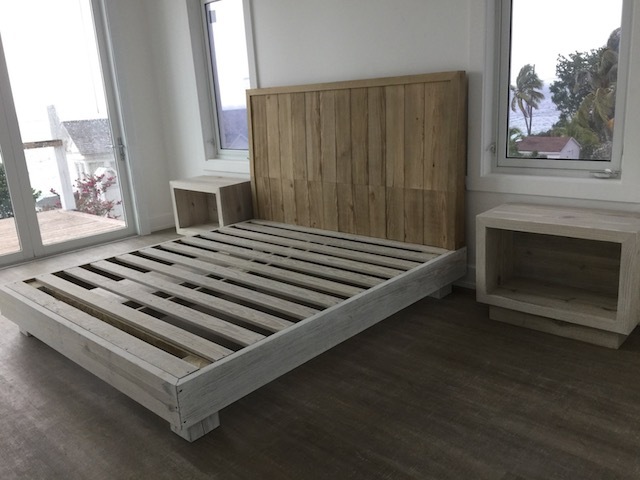 I came up with some designs for the beds and the nightstands – Bob did all the detailed working drawings and Julian Carey from Tarpum Bay Shopping Centre supplied the best quality lumber – treated of course so that it is not attacked by the dreaded termites . You can see from the pictures that the headboards have a rake on them – meaning that they lean back slightly from the bottom to the top – and here is the reason why ! If you are reading your book in bed , it is much more comfortable to have the slight backward incline than a headboard that is just a flat board up and down. Designed by keen readers ! This room in the Modern House has twin beds that can be joined and made into another king…. The final finish is a color wash – more forgiving than a solid paint finish and I am delighted with the results. Most of the bedrooms are big enough to take a king size frame and generous sized nightstands – but the bedrooms in the 2 old houses are smaller so we had to make a smaller version of the nightstands and also make queen size beds for the 2 smallest rooms. This is the reduced size nightstand that we are having in the bedrooms at Cornerwall and Flora’s House. The weather has been extremely hot – and no rain at all – so they have all been made outside under a tent – but just as we are coming to a lot of the finishing stages – today in fact – the weather has changed and we look as if we are due for a big storm ! So all operations are moved inside ! This one is in the top floor suite at the Modern House. 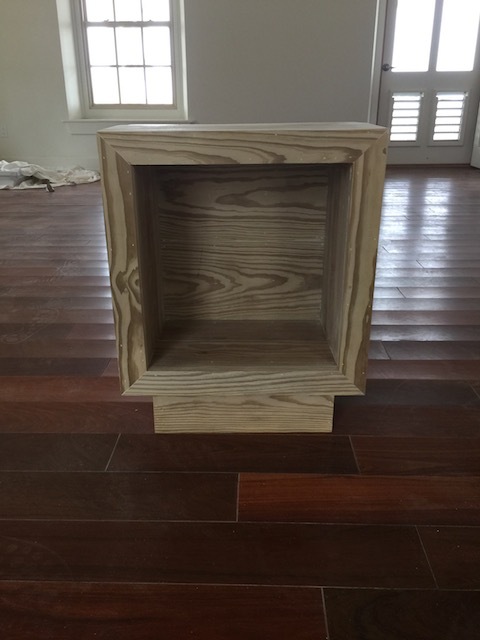 I love how the nightstands have turned out…. 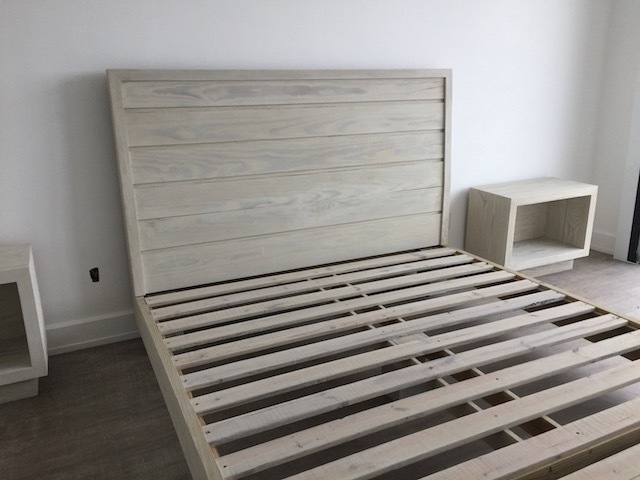 Of course there will be plenty of pictures once they are really finished and the beds made up – my favorite part is the final ‘shooshing up’ as I call it ! 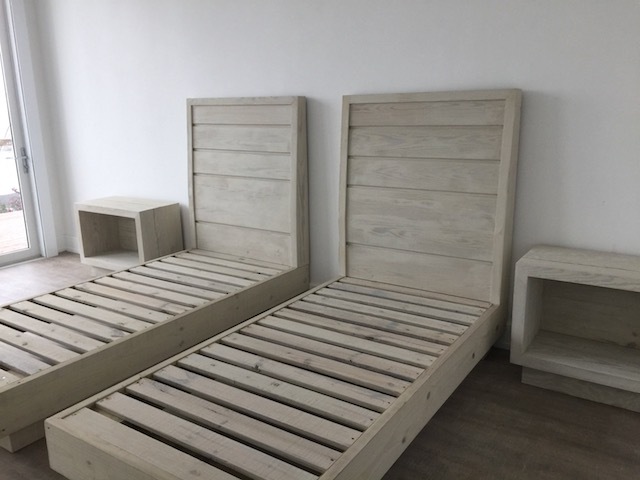 The cost is not really any different – they are very labour intensive and they have a lot of finishing, but I do love the fact that they are solidly made – no worries however large the occupants are ! 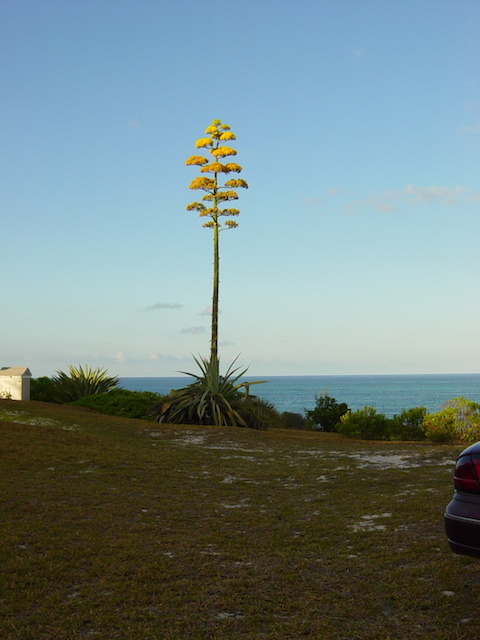 and also that we have something that is handcrafted right here in Eleuthera……. On a different note – food ! – we have recently had a couple of really lovely meals at La Bougainvillea – near Palmetto Point. Do check it out if you are on the island. Thursday night is pizza night – and last we had a fabulous seafood medley one – absolutely yummy ! Beautiful Kathy! Thanks for sharing! Where he always is – making mischief ! That finish is timeless, perfect for our environment here and like you, I am so pleased you were able to tap our local talent. Great job! It is a blessing when we can give back to the people here. My heart leaves a little piece every time I must return to the states. I am doing that soon…. We are traveling next week and already I can’t wait to get back ! So glad you are supporting the local economy and reducing the carbon footprint by shopping local! Bravo! Always wonderful! What talent! And, right there at home! I know ! very happy with what is being done here…..
What is the full name of the furniture maker you worked with? Do you have an email or other contact for him (Facebook page? It is one of our employees – Rikki Thomas. At the moment he is just working for us – not doing any freelance – but maybe later on….. Sorry !